I am deeply saddened to learn of the passing of President George H.W. Bush. I’ll remember President Bush as a strong leader, a fierce defender of our great nation and a loving family man. His extraordinary lifetime of service will continue to inspire Americans forever. “I was saddened to learn of the death of former President George H.W. Bush. He led our nation through some of the most significant global changes in the modern era, not only as the 41st President, but also through his service as Vice President, Director of the CIA, top U.S. envoy to China, Ambassador to the U.N., U.S. Representative from Texas, and as a naval aviator during World War II. “The world lost an esteemed statesman, decorated Navy pilot, and accomplished public servant. He will forever be remembered for his service and the impeccable legacy he left behind. As a WWII Navy veteran, Member of the House, Ambassador to the United Nations, Chairman of the Republican National Committee, Director of the CIA, Vice President and 41st President of the United States, there is no question that President Bush devoted his life to serving his fellow Americans. My prayers are with President Bush’s loving family and many friends. As we mourn the loss of this inspiring leader, I also hope we will honor his legacy by serving others in our own lives. George H.W. Bush was a statesman and patriot who dedicated his life to our country. Our nation’s last World War II veteran to serve as Commander and Chief, President Bush will be remembered as one of our nation’s greatest leaders and problem solvers. It was a honor to have had the privilege of serving in his Administration, and through President Bush, I learned that any successful life had to include giving back and serving others. He instilled in me my desire to serve. President Bush was a devoted husband and partner to his beloved Barbara. He was a father and mentor to George, Robin, Jeb, Neil, Marvin, and Doro. He was kind and thoughtful — a man of purpose filled with grace. One thing that President Bush said has stayed with me all these years: “No problem of human making is too great to be overcome by human ingenuity, human energy, and the untiring hope of the human spirit.” Steve and I extend our deepest condolences to the Bush family. RIP President George H.W. Bush. Our prayers are with the entire Bush family as we mourn the loss of an American hero and statesman. His impact on our country as a WWII vet, Congressman, CIA Director, Vice President, and President cannot be understated. Robin and I join the country in sending our deepest condolences and prayers to the entire Bush family as they mourn the loss of former President George H. W. Bush. His lifelong service to our nation will never be forgotten and his legacy will live on for generations to come. Rest In Peace 41. “I am saddened to hear of the passing of President George H. W. Bush. He was a dedicated leader and statesman who served our nation throughout his life as President, Vice President, Director of the Central Intelligence Agency, Ambassador and Congressman. He also served in the U.S. Navy during World War II. “Beyond his work, he and his late wife, Barbara, were living examples of integrity, decency and honor. They not only gave their lives to this nation but raised a family that has gone on to continue their legacy of service. In addition, Governor Nathan Deal has ordered the flags of the United States and State of Georgia be lowered to half staff for 30 days beginning today. I supported Bush over Reagan in 1980. G.H.W. Bush may well be the last Republican candidate for President I support in my lifetime. Mistakes were made, but I don’t think they were at the level of war crimes. I didn’t vote for him but I really liked this guy. RIP Mr. President, they don’t make them like this anymore. Since my posts were deleted and an objective, fact-based discussion on Bush 1’s legacy apparently isn’t allowed on this site, he’s the best president ever! Perfect guy. We just need more civility and bipartisanship! I miss the good ole days! [Insert another acceptable, revisionist history-based reaction to politician’s death). Here’s what I think: let’s allow the body to reach room temp before we start the partisan assualts. Politics is so toxic that we’re beginning to lose our humanity. Bush 1 wasn’t perfect and neither are you but they’re lots of people who loved and respected him. There’s plenty of time to debate his legacy, but can’t we agree he was a civil, humanitarian with whom we have policy disagreements? He’s not a war criminal or a genocidal manic! I never voted for him but I don’t hate him and I find much about his life to be admired. How many days must pass before an honest conversation is allowed? During that time, I recommend you turn off cable news and begin your research reading objective reports about Iran-Contra and the Gulf War. I can’t answer your questions. Find your humanity and you will know. Being courteous when speaking of the recently departed is a sign of having class. You do this for you, not for them. Yes, Mr Bush is dead and nothing you say or do will hurt him. But…you’re still alive and every debasement of your soul harms you. I always appreciated that Bush was a great fan of the game. 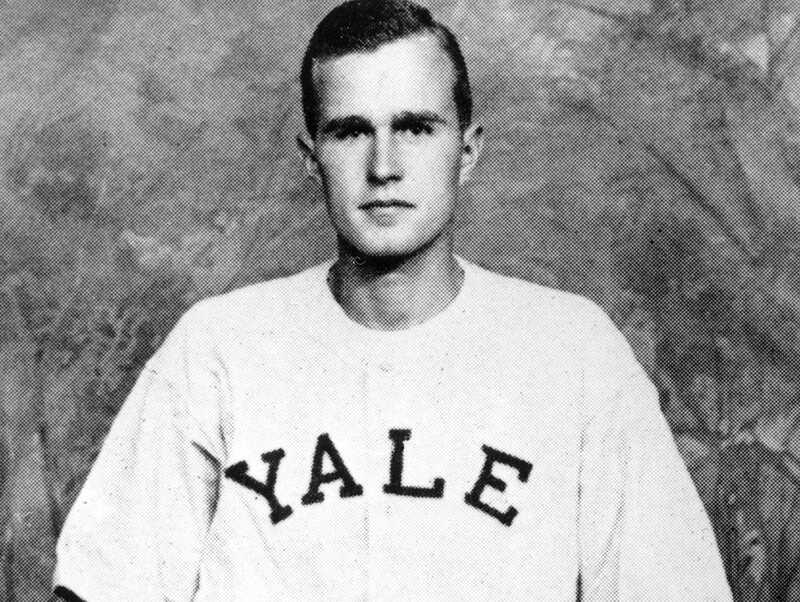 GHWB’s lifelong love affair with baseball.